Welcome, my friends, to this latest installment of Distant Worlds: Universe. In this round, I run into some problems that…I’m not sure how to deal with. The first and foremost are a band of “phantom pirates” that have some serious firepower and keep attacking some of my outlying assets. I sent one of my fleets to try and deal with them but they were made short work of, and I don’t even know where their base is in order to mount any kind of counterattack. Couple this with resource shortages (that I am trying to deal with) and planets that won’t let me colonize them and I feel like I’m hitting something of a wall. I’m honestly not sure how to deal with some of these threats, so at one point I put the AI on fully automate to see how it dealt with them. It was at this point that I noticed we’d slipped from first to second place in the overall rankings, which was kind of a punch in the gut. At this point, I began to feel lost and unsure of myself. What do I do next? How do I deal with these threats at my door? This is where you come in, as I could use some help. If you decide to watch most or all of the video below, I’d like your suggestion as to what to do next? Build more ships? Abandon colonies (can one even do that?)? I don’t like asking for help, but right now I feel like I’m at my wits end. Therefore, if you have a great idea, I’d love to hear it. Thanks for watching, and enjoy! Resource shortages are killer. I don’t have many specific recommendations there. For phantom pirates: I’ve had that a couple times. Both times, I deployed resupply ships with long-range sensors in the area to start to track down the pirate scourge. With one or two scouts under manual control to peek in star systems near the hits, this has let me track down their base each time. 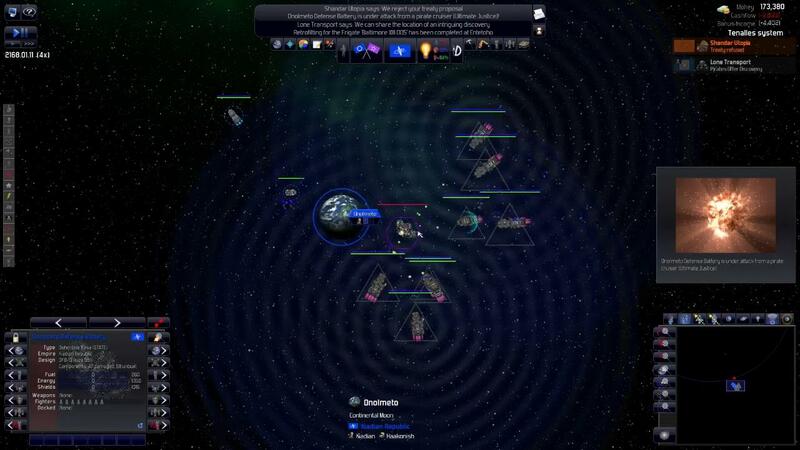 One time, even after I took out their base (at great cost), their ships continued to attack (though less often it seemed). I eventually built a small, purpose-built fleet of ships focusing on capture technology and started capturing the pirate ships. This seemed to go better than trying to destroy them. In all other cases, I just had a strike group or fleet in the area, ready to respond right away. I see your problem already with this game. If you keep pausing as often as you do, nothing happens in the universe, you are not letting the game run. Let it run, stop pausing it to read things. You don’t have to stop the game to read things, you are a director of your empire, not the person actually flying the ships. If something messy starts to happent hat you need a handle on then by all means pause. You have to design your own proper custom ships too. Agreed. While it can be time consuming, custom ship design has become essential for me. As for your other issues, have you tried putting the pirates to work for you? Hire smugglers to get your missing resources. Put protection missions on key outlaying areas. As for finding the pirates, I also agree with Josh–long range scanners. I like Larry’s technique of designing an explorer with lots of fuel (and energy collectors), high speed, and fast turning (to warp out faster) with a LRS. Make a few of these and just park them around the area to keep an eye on things for you. If you park them near stars and your collectors gather more than your static output, they can stay pretty much indefinitely. Most of these suggestions assume you have some cash. If you don’t, you may need to work your way out of that hole first. Thanks for these tips man, much appreciated! Next story Firefly Online Trailer Posted!! !